Empires Comics Vault: Our favorite Derby Girls will be down on FCBD 2014! Women's and junior's roller derby located in beautiful Sacramento, California. We're excited to have the Sac City Rollers join us for a second year at our Free Comic Book Day Mini-Con. This year, FCBD Mini-Con is Saturday, May 3, 2014. Doors open at 9 am. The Sac City Rollers, Sacramento’s first all-women’s flat track roller derby league, is made up of well over 100 active skaters dedicated to the amazing sport of Roller Derby. On June 1, 2012, the Sac City Rollers graduated from the WFTDA Apprentice Program and are proud to be a full-fledged WFTDA league! Established in January of 2006, the league has quickly grown to include traveling interleague teams (the Capital Punishers and the Folsom Prison Bruisers), intraleague teams (the Sweaty Betties, the Rude Girls, and our newest team, the Notorious Knockouts), and our Junior Derby League (the Bad Apples) for girls 10 – 17 years old. The women of the Sac City Rollers practice three times a week and schedule a competitive bouting season locally and nationally from March to December. They wrap up each season by hosting their own "Red Red Holiday Invitational" in which skaters from over a dozen West Coast Roller Derby leagues compete, and proceeds are donated to the Sacramento Food Bank and Family Services. Operating as a non-profit, self-governed organization, the Sac City Rollers strive to promote Roller Derby, but also serve our community by providing unparalleled competition and entertainment. In addition to community outreach, Sac City Rollers members volunteer their time and raise money for local and national charities such as Sacramento Children’s Home, the Sacramento Food Bank and the Saint Baldrick’s Foundation. "We acknowledge the support that we receive from our surrounding communities and strive to reciprocate that support by being involved in local charities through donations and volunteer work. SCR is an enthusiastic supporter of Roller Derby leagues locally, nationally and internationally." 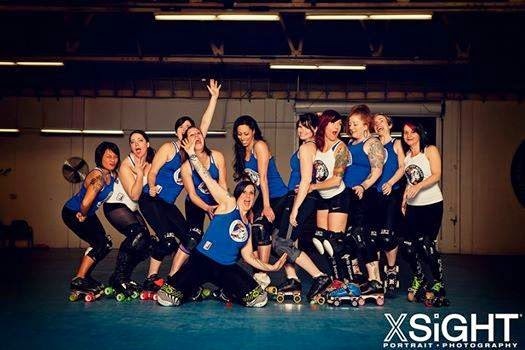 Follow the Sac City Rollers on Twitter, Instagram, and Pinterest!